1) TroopTrack now has full support for UTF8 mb4 character sets. Wait. What? Yeah, that's probably gibberish to most people, but here's what it means: you can now use emoji everywhere in TroopTrack. If you want to have a scout named 🔮you can totally do that. There's going to be a lot of "the youth member formerly known as Jenny" in our futures. Okay, maybe that's not likely. But you guys use emojis all over the place, and we used to crash unless you used a very specific set of emojis. No more. We are super excited about it at TroopTrack because we hate it when things crash. 2) We can now import Scouts Australia data from Dibbs export files. Contact the help desk if you'd like us to do that for you. 3) The participation tab on the user profile now shows all events the member was invited to whether they attended or not by default. 4) You can now sort files on a user profile by the date they were uploaded. 5) Web pages with no contents were crashing. This is fixed. 7) Board of Review Worksheets (BSA only) were crashing for certain scouts. Fixed! 8) Some people don't like the fact that any member can use the email feature to send a message to every member of your unit using the "CC" field. If you are one of those people, there is a new setting you can use to limit the CC list to people they have access to based on their access level. Just go to Manage -> Settings -> Edit Troop Settings and click on the TroopTrack Settings tab. The setting is called "Restrict Emails". Next week is Spring Break in Weatherford, TX, where many of our staff members live. As a result, we are going to have reduced support for the week as we deal with the fact that everyone wants to go on vacation (me included!). We will still have coverage of the help desk every day, but the office will not be open normal businesses hours and we may be unable to answer the phone. Thank you for your patience - my family and I are going to Universal Studios in Orlando and I am really looking forward to the break! 1) You can now create a meeting schedule from an existing event. To do this, just visit an event details page and click on "Repeat Event." 2) We've made it easier to print a board of review worksheet. You can now print a BOR worksheet directly from a user's profile. I've included a pretty picture. 1) We are having some trouble with TurboNET advancement reports. They work in most cases, but cub scout packs with Tigers in them continue to cause us problems and so does the recent addition of a survey question by the BSA to ScoutNET. Ryan is working on this. 2) Our database does not fully support the cute special characters (emoji) that people like to use in email, web pages, etc. This causes errors when people try to use emoji in fields we haven't specially configured to support them. We are working on an update that will allow the use of emoji in any text field anywhere in TroopTrack. Ryan is also working this. 1) When we "solve" one of your support requests, the email you receive will include a section for you to rate the support you received. It's really important to us that you take a minute and let us know how we did - customer support is a big part of our never-ending quest to make TroopTrack better every day. 2) When you rate a help desk ticket, you will also be able to leave comments if you desire. 3) The "full edit" link on meeting schedules was intended to take you to the "full" form for editing events, but it did the same thing as the quick edit link. This is now fixed. 4) There was a minor security issue in the way meeting events were saved. We have fixed this. 5) The columns on the meeting schedule detailed view were not lined up properly. Fixed it! 6) We gave you more room for the description fields in meeting events. 1) The "custom directory" option under Communicate is now available for Australian scouters. 2) The wording on the newsletter was changed for events which don't require you to RSVP so that it just says "Get more information about this event here:" instead of "Get more information about this event, RSVP, or change your RSVP status here:"
3) We were not listing empty households on Manage -> Members -> Households. You now have the option to see those households. 4) Creating a new leader with a new household was not building the household properly. This is fixed. We've had a lot of people try out the new subdomain email and marketing site features that are currently in Alpha and have gotten lots of great feedback. We are always interested in learning more, so please let us know how those features are working out. ScoutNET is currently down for maintenance. We won't be able to do anything until BSA completes their release. TurboNET will work as soon as ScoutNET comes back. 1) Boys with completed ranks who were upgraded to 2016 ranks or downgraded to 2015 ranks were being listed as Scout (0%) on the patrol page. This is fixed. 2) Monthly meeting schedules that weren't supposed to start right away were doing that anyway. This is fixed, thanks to Spencer. He's got an eagle eye for weird bugs like that. 3) Spencer's bug fix for meeting schedules got me thinking about a similar problem with regular recurring events, so I checked it out. Sure enough, the root cause was the same. This is also fixed. 4) Meeting schedules were ignoring your selections about sending invites and reminders. Spencer fixed this too. What a guy! Have a great day. Try not to have a Monday! Friday I am traveling to Maryland to hang with the Sea Scouts! 1) Ryan made some cool improvements to the way we update production. It used to take about 14 - 17 minutes to update the site, but now it takes about 2 minutes. This makes it a lot easier for us to deploy even in high traffic times, something we have been forced to avoid in the past. 2) For customers trying out the subdomain email feature, we have fixed a number of places where we were displaying the email address incorrectly. 3) Previously email messages would have a status of "Scheduled" even though they had actually failed to be delivered. We have changed the process to update the status to "Failed" and to include an explanation of what causes failures. 4) There is a new setting to let you use a "slim" version of the header. This will give you more vertical real estate. You can also customize the background color and the menu color. Just go to Manage -> Settings -> Edit Troop/Pack Settings and then go to the "TroopTrack Settings" tab. Here's a screenshot. 5) We made it possible for us to decide which awards are added to a youths record when you change their level. Sometime today we will be adjusting AHG awards so that only level awards are added. 6) We moved two alpha features into production that I will be announcing a little bit later. We will be looking for brave customers to try them out. 1) Subdomain email addresses. You can use your troop subdomain in your mailing lists - instead of sending emails to somelist-mytroop@trooptrack.com, you would send them to somelist@mytroop.trooptrack.email. Not only does this make your email addresses easier to remember, there are a number of technical benefits as well. By using subdomains, we are able to improve the speed and reliability of our email service, as well as handling attachments better. It also paves the way for cool features down the road, like true conversations, more flexible mailing lists, and better tools for resolving email issues. If you want to try this feature out, please ask your account owner or someone with "Manage Troop Settings" privileges to submit a help desk ticket requesting access to subdomain emails. 2) Fancy public web site. It's hard to explain, so just check it out here: https://demo.trooptrack.com. If you turn this setting on for your main public page your existing web site will be displayed using the same layout as the demo site above. This layout looks nice but it has limits. You can't have long scrolling pages or go more than 3 pages deep in your menus. It also won't work well if you have more than 4 or 5 main pages. But... if you like the look and your content is concise enough, it's a nice way to make a very modern looking web site for your unit. This feature may require you to have some simple HTML skills. If you want to try this feature out, please ask your account owner or someone with "Manage Troop Settings" privileges to submit a help desk ticket requesting access to the marketing site feature. I hope you find these new features as exciting as we do! 3) In some cases monthly meeting schedules were generating events on the wrong day. This is fixed. 8) We tried using a native datepicker for meeting schedules, but this doesn't work in all browsers, so we added a datepicker for browsers that don't support the native datepicker. That's all folks. Have a great day! Earlier today I posted that we were going to release the new "Service Stars" feature for American Heritage Girls Troops tomorrow. I was totally fibbing. It just went live! Go to Achieve -> Manage Service Stars to try it out. First off, thanks to everyone who has tried the new Meeting Schedule feature. We experimented with a new datepicker on that feature and many of you have reported that it doesn't work on Safari. We are working on a fix and will incorporate your feedback into Meeting Schedules soon. 1) You can now "close" a money account. Closed money accounts cannot have new transactions added or be used for event payments. If you close an account accidentally you can reopen it. To close an account, go to Manage -> Money Accounts and click the "Actions" drop down for the account you want to close. 2) The BSA permission slip was using a font that was too large for phone numbers and dates to fit in the form. This has been fixed. 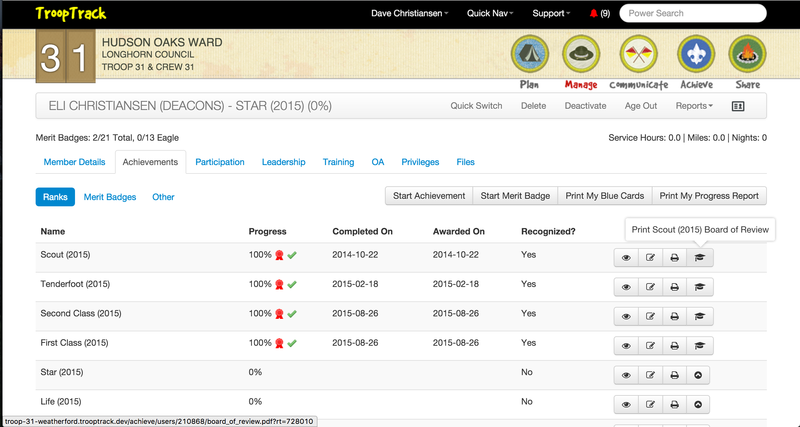 3) We no longer show Scout through First Class on the drop down list for applying merit badges to ranks. 1) We were previously showing the BSA Permission Slip feature to Scouts Australia groups and some other non-BSA groups. This wasn't helpful and we've disabled it until we can get our hands on official permission slips for these groups. 2) Spencer has added a new privilege that allows you to separate the ability to purchase awards from the ability to record progress on achievements. This new privilege is now needed to mark awards purchased, presented, etc. and to purchase awards through TroopTrack if that feature is supported for your group. This privilege was automatically added to anyone in your group who currently holds the update achievements privilege, so if you don't want to restrict anyone you don't need to do anything. 3) We rolled out a new "Meeting Schedules" feature. 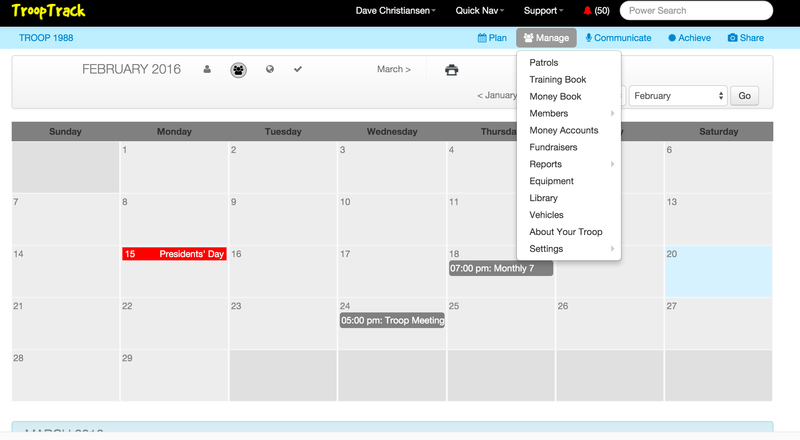 This is a new tool for planning recurring meetings like troop meetings, committee meetings, etc. You can try it out by going to Plan -> Meeting Schedules. It is available to anyone with the Manage Events privilege. Currently you can still create recurring meetings the old way, but we plan to remove that feature in a week or two if there are no major snags with the Meeting Schedules feature. I think you will find the Meeting Schedules feature to be much easier to use than the old recurring meetings capabilities. Have you ever tried to make a poster, slideshow, presentation, or something else with your TroopTrack photo albums and found yourself frustrated with the difficulty of finding and downloading photos to your computer so that you could edit them? We already know the answer for many of you because we've gotten about a zillion help desk tickets along these lines over the past year. - Runs on OS X and Windows. The best part of this announcement is that Photo Sync is free open source software. There is absolutely no charge for it, and if you have the right nerd skills you can download it and change it to suit your own needs. And if you add a feature you think others would like, you can submit it as a pull request and we may include it in the product. See some screenshots and download TroopTrack Photo Sync today!